Top quality supple leather palm and fingers. Nylon gusset for better flexing. Ergonomically designed split fingers and thumb. Sponge padded leather back for snugger fit. 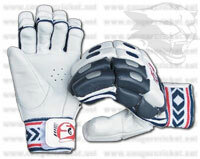 Extra protection on first two fingers of lead hand reinforced with strong rounded plastic inserts. Lightweight HD foam finger rolls and split thumb. Two side-bars on lead hand. Leather tabs on finger tips. Extra leather patch on hard wearing areas of palm. Towelled wrist-band for snugger fit with wide velcro fastener. The choice of VVS Laxman.